White, a retired elementary school teacher and principal, has not gotten hearing aids, although she says she probably will in the future. Instead, she's part of a group of people testing out a different intervention for dealing with hearing loss: learning music. "The complaint often is, 'I hear just fine when I'm speaking to someone one-on-one, but when I'm in a crowded situation – if I'm a party, if I'm at bus station, if I'm in a mall – speech in noise becomes very problematic,'" Russo says. And hearing aids can only help so much, because separating speech from noise is not so much a task for our ears as it is for our brains. As people age, something declines along the pathway between the inner ear and the brain's auditory cortex, explains Russo. "So, the hearing aids we have that are becoming increasingly remarkable in their ability to suppress noise, they can't completely correct this problem of aging auditory systems," he says. The choir is run through Ryerson's 50+ Continuing Education Program. Each session lasts ten weeks, with one two-hour rehearsal each week. "We wanted to see how short-term could we make the musical training. How quickly can we see these improvements?" says Ella Dubinsky, a graduate student in the SMART Lab who recruits study participants from among the choir singers. She grew up playing music with her family and later studied classical piano. "Singing is sort of like brain boot camp. You're sort of whipping your neurons into shape," she says. The dozen or so participants in the current session are nearly all women. They're working on four tunes that are familiar to this crowd, including "Love and Marriage" and Charlie Chaplin's "Smile." 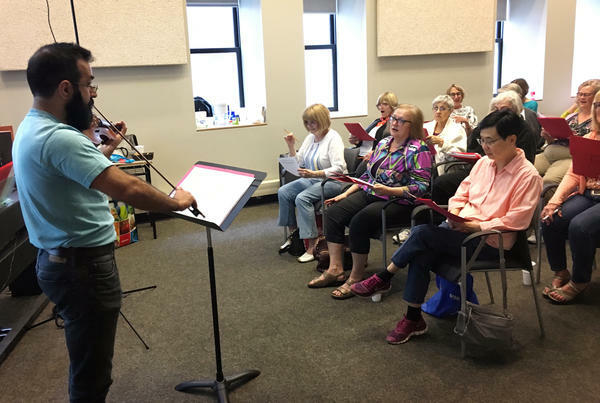 Choir director Sina Fallah puts them through vocal challenges, such as singing a D-minor scale, ascending and descending, under the melody of "Brother Can You Spare a Dime," which he plays on violin. "My duty, of course, is to make sure they have fun. They also learn something. They become better singers," Fallah says. In addition to the choir participants, the researchers are following two control groups. One is not singing, but is listening to a lot of music in a music appreciation course. The other has no musical intervention. And all of the study participants undergo before-and-after lab evaluations that include speech-in-noise tests, in which they're asked to repeat sentences that are played against increasingly loud background noise. Using Theta Music Trainer software, participants practice their singing at home, trying to match sequences of notes played from the computer. The program evaluates the singing, and tells the participants whether they're sharp, flat or right on the money. Another exercise involves listening to two notes played on different instruments, and choosing the one with the higher pitch. The different timbres of the instruments make the exercise challenging. To Frank Russo, that's important progress. He says one way we follow a particular voice is by locking onto its pitch, allowing us to use frequency as an anchor. "When we're listening to voices and speech, there's a frequency trail we can follow, but it's often buried under a din of noise. But if our brains have improved in tracking that anchor, we can better reconstruct the nuance of each speech fragment," he says. "So that's the presumed mechanism for why this pitch training is so important." Russo says the research is a little messier than he would like. People who sign up for the choir may have more musical interest and, conceivably, more ability than the control groups. The choir may also yield social benefits that improve people's outlook and performance. But it's a messiness he can live with. "There's been this general liberalization of science that makes it ok to ask these messy questions now," he says. Clip 1: "His plan meant taking a big risk." Clip 2: "The baby slept in his crib." Clip 3: "The workers are digging a ditch." 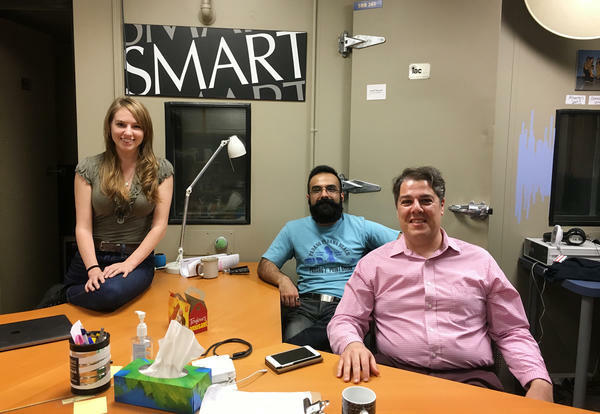 It's after-hours on a Wednesday at the SMART Lab of Toronto's Ryerson University. Time for a weekly jam session for the lab's band. SIEGEL: SMART stands for Science of Music Auditory Research and Technology. It's in the Psychology Department. And as the acronym implies, these people work at the crossroads of neuroscience and music. They're all engaged in both. It's an intersection that we'll be exploring this week. The lab does research on how music affects emotion, on how music could help people with autism or Parkinson's, or in the experiment that I went to learn about, how it might help older adults figure out what someone's saying in a noisy environment. Professor Frank Russo, who is playing guitar, is director of the SMART Lab. He says the most common complaint of hearing loss typically goes something like this. FRANK RUSSO: I hear just fine in front of my television set. Of course, the television is, you know, at some very high level. And I hear just fine when I'm speaking to someone one-on-one, but when I'm in a crowded situation, if I'm at a party, if I'm at a bus station, if I'm in a mall, speech and noise becomes very problematic. SIEGEL: Separating speech from noise is not so much a task for our ears as it is for our brains. Professor Russo speaks of what our ears do as the peripheral aspects of hearing. But in this problem, something declines with age along the pathway between the inner ear and the brain's auditory cortex. RUSSO: So the hearing aids that we have that are becoming increasingly remarkable, they can't completely correct this problem of aging auditory systems. SIEGEL: I put my own aging auditory system to the test for separating speech from noise. I'm pushing 70, but I've always aced my hearing tests. This one, though, was tough. I was in a soundproof booth wearing headphones and listening to a recording produced by Etymotic Research. It's called the QuickSIN test. UNIDENTIFIED WOMAN #2: Every word and phrase he speaks is true. SIEGEL: I had to repeat as best I could what that single voice was saying as it became progressively overwhelmed by many other voices. It was like trying to follow an inane conversation at the cocktail party from hell - at first, not so hard but not for long. UNIDENTIFIED WOMAN #2: The couch cover and tall drapes were blue. SIEGEL: The couch cover and tall drapes were blue. UNIDENTIFIED WOMAN #2: The stems of the tall glasses cracked and broke. SIEGEL: The stems of the tall glasses do something but I don't know what. SIEGEL: Here's the good news for some of you. Research shows that aging musicians fare better than non-musicians when it comes to distinguishing speech from noise, even when their overall hearing is no better than that of the non-musicians. RUSSO: So the peripheral aspects of their hearing are just the same, but there's something different in their brains. SIEGEL: So Professor Russo and his crew at the Ryerson SMART Lab started an experiment that's still in progress. They got some older adults to join a choir with no musical experience or talent required. RUSSO: We thought that it would be very informative to take a group of older adults who do have hearing loss and who are not active in music and introduce them to music. UNIDENTIFIED CHOIR: (Singing) Love and marriage, love and marriage go together like a horse and carriage. SIEGEL: The choir is run by Ryerson's 50-plus continuing education program. Their choir director is Sina Fallah, who also works at Frank Russo's lab. The participants are nearly all women, and Sina Fallah puts some vocal challenges to them. At one point during "Brother Can You Spare A Dime?" they have to sing a D-minor scale ascending and descending while he plays the melody on violin. SIEGEL: Most of these singers are in the SMART Lab study. They were recruited by Russo's graduate student, Ella Dubinsky. ELLA DUBINSKY: Well, I think that everyone can be turned into a musician. My goal is just to get music everywhere. SIEGEL: Ella Dubinsky sings, she plays guitar and studied piano seriously. She grew up playing music with her parents. Her whole life has been accompanied by music, for the choir singers, this program runs just 10 weeks. DUBINSKY: We wanted to see basically how short term could we make the musical training? You know, how quickly can we see these improvements? SIEGEL: It's not just about showing up for the weekly choir session, there's homework, too. Ella Dubinsky took us to the Toronto apartment of Linda White, a retired elementary school principal who sings in the choir. She's 77, and she's familiar with the problem of not hearing speech through noise. LINDA WHITE: Mostly in an informal gathering where people are all talking at once. The person could be right beside you but you still don't hear them. SIEGEL: Her choir homework includes several exercises on a computer using a program called Theta Music Trainer. WHITE: Yeah, this is one I have a lot of trouble with. SIEGEL: It involves hearing two notes played on different instruments. SIEGEL: She has to pick which one has the higher pitch. We'll play it again. SIEGEL: It's the second one. The different timbres of the instruments make this exercise challenging. Here's another pair. SIEGEL: The second note was higher. In another exercise, Linda White has to sing. The computer program plays a sequence of three notes, and she has to repeat them after pausing for four beats. WHITE: (Singing) Fa, re, do. SIEGEL: The computer tells her if she's sharp or flat or right on the money. The theory behind the experiment that Ella Dubinsky is working on is that by improving her sense of pitch, Linda White is training her brain. DUBINSKY: I sometimes consider it brain boot camp. You're sort of whipping your neurons into shape by training them to do this. WHITE: Yeah. I guess for people like me that haven't done a lot of music, it perhaps takes longer, but it's quite possible. It's not impossible, right? SIEGEL: Professor Frank Russo explains it this way. He says, one way we follow a particular voice is by locking on to its pitch, allowing us to use frequency as an anchor. RUSSO: There's a frequency trail that we can follow, but it's often buried underneath the din of noise. RUSSO: But if our brains have improved in tracking that anchor then we can better reconstruct all the nuance of each speech fragment. SIEGEL: There are control groups for this experiment. The Ryerson University SMART Lab is following one control group that isn't singing but is listening to music in a music appreciation course and another control group that's not doing anything musical at all. They're all measured in before and after lab evaluations that include EEGs which measure brain responses to sounds and also the speech and noise test that I took. Professor Russo admits that this research is a little messier than he would like. People who sign up for the choir may have more musical interest and conceivably more ability than the control groups, and the choir may yield social benefits that improve people's outlook and performance. But this is all a messiness that he can live with. RUSSO: I'm personally interested in doing this impactful work, but there's also a funding climate that supports it that would not have been there 20 years ago. There's been this general liberalization of science that makes it OK to ask these messy questions now. SIEGEL: And the Ryerson University SMART Lab figures it will have some encouraging answers to report this summer. Tomorrow, studying music and grammar in children. UNIDENTIFIED CHOIR: (Singing) Like a drunk in a midnight choir, I have tried in my way to be free. Transcript provided by NPR, Copyright NPR.